1X30MR has four reticles that can be switched instantly. The reticle dots are illuminated in two colors: Green and Red. Includes weaver rings that work with any Picatinny/Weaver rails or bases. 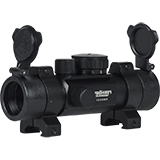 Eye relief: Unlimited Sight overall length: 6"
Accessories included: Flip open lens covers, and rings.